In the bag with the green pillowcase lace featured in yesterday’s blog post were two hand charted patterns. 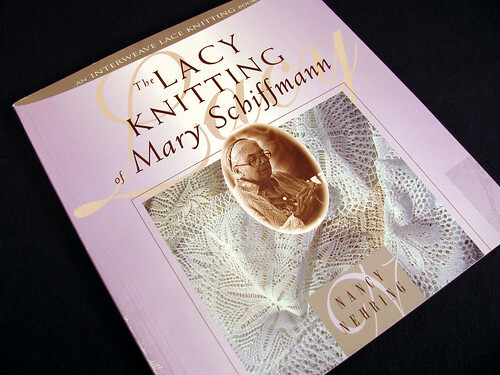 It took me awhile to remember that the patterns came from the book by Nancy Nehring, “The Lacy Knitting of Mary Schffmann”. I thought maybe there weren’t any charts in the book so that is why I had to hand draw the charts. No that wasn’t the case, the charts in the book are just oddly done. The stitches don’t line up from one row to the next. 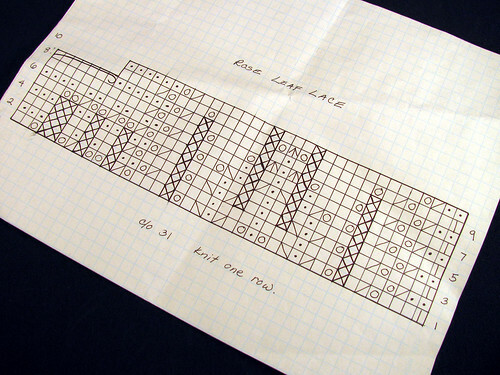 Also each row is charted as it is knit, first row right side, next row the wrong side. So the garter stitch sections look like stockinette to me. I much prefer that the chart show the right side of the knitting, so the chart actually looks like the finished knitting. I learned to read charts at the library where I first came across one of Barbara Walker’s books. I was in high school at the time and xeroxing was expensive. So I would go and hand copy the patterns I wanted to try knitting. So maybe I am biased about how charting should be done. Since the patterns in the lacy knitting book are old and have been passed down from one woman to the next through many generations, I think it is all right to share my hand drawn versions. The book is a good one to have in a knitting library even if the charts have to be redrawn to make knitting from them easier. This chart was in the bag too. I think knit one row means to start with a plain knit row. 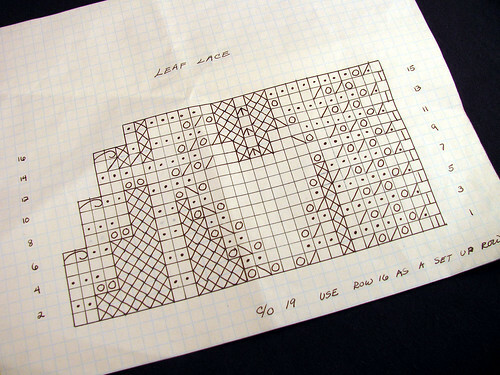 This is the pattern I used for the green pillowcase lace. Notice the yarn overs are over empty squares unless next to a decrease. This just makes more sense to me. This entry was posted on Sunday, February 8th, 2009 at 3:00 am and is filed under Knitting and Lace. Tagged: Book, Knitting, Lace. You can feed this entry. You can leave a response, or trackback from your own site.